Get a sense of the local culture at Palacio da Bolsa and Porto Cathedral (Se Catedral). We've included these beaches for you: Praia do Carneiro and Praia de Lavadores. Spend the 29th (Mon) wandering through the wild on a nature and wildlife tour. And it doesn't end there: snap pictures at Ponte de Dom Luis I, look for gifts at Garrafeira do Carmo, appreciate the history behind Monumento aos Herois da Guerra Peninsular, and kick back and relax at Praia do Homem do Leme. To plan Porto vacation without wasting time, ask Inspirock to design an itinerary. Belo Horizonte, Brazil to Porto is an approximately 14.5-hour combination of bus and flight. You can also do a combination of bus, flight, and train; or do a combination of bus and flight. You'll lose 3 hours traveling from Belo Horizonte to Porto due to the time zone difference. In July, daytime highs in Porto are 28°C, while nighttime lows are 17°C. Cap off your sightseeing on the 30th (Tue) early enough to travel to Albufeira. Visiting Praia Da Rocha and Praia da Marinha will get you outdoors. 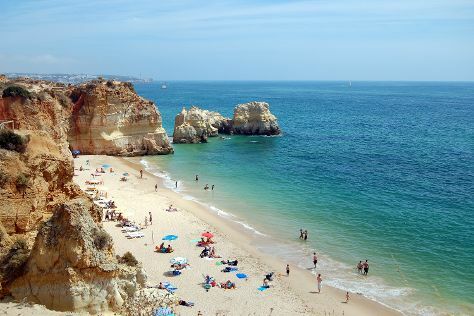 Your itinerary includes some good beach time at Falesia Beach and Algarve. You'll find plenty of places to visit near Albufeira: Dolphin & Whale Watching (in Olhao), Ponta da Piedade (in Lagos) and Stand-Up Paddleboarding (in Armacao de Pera). There's still lots to do: tour the pleasant surroundings at Pescadores Beach. For where to stay, traveler tips, more things to do, and other tourist information, refer to the Albufeira road trip planning app . Getting from Porto to Albufeira by flight takes about 4.5 hours. Other options: drive; or take a train. Traveling from Porto in July, things will get a bit warmer in Albufeira: highs are around 34°C and lows about 23°C. Finish your sightseeing early on the 2nd (Fri) to allow enough time to drive to Sagres. Though the town of Sagres has roots in the Portuguese Age of Discovery, it is better known by visitors as a peaceful, rugged resort spot with great surfing beaches. Take a break from the city and head to Praia Da Amoreira and Amado Beach. Do some cultural sightseeing at Cape Saint Vincent and Fortaleza de Sagres. Venture out of the city with trips to Bordeira Beach (in Carrapateira), Arrifana Beach (in Aljezur) and Praia da Cordoama (in Vila do Bispo). There's still lots to do: kick back and relax at Telheiro Beach. To see where to stay, traveler tips, more things to do, and other tourist information, refer to the Sagres trip planner. You can drive from Albufeira to Sagres in 1.5 hours. Alternatively, you can take a bus; or do a combination of train and bus. Expect a daytime high around 34°C in August, and nighttime lows around 23°C. Wrap up your sightseeing on the 5th (Mon) to allow time to drive to Lisbon. Your cultural itinerary includes sights like Museu Calouste Gulbenkian and Jeronimos Monastery. Give yourself a bit of retail therapy at Avenida da Liberdade and Alfama Gourmet. Explore Lisbon's surroundings by going to Sintra (Quinta da Regaleira & Park and National Palace of Pena). 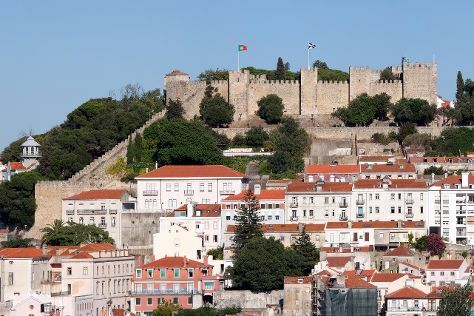 There's still lots to do: steep yourself in history at Castelo de S. Jorge, browse the eclectic array of goods at Feira da Ladra, take a stroll through Belém Tower, and admire the masterpieces at National Tile Museum. To see photos, reviews, other places to visit, and more tourist information, read Lisbon tour builder tool . Drive from Sagres to Lisbon in 3.5 hours. Alternatively, you can take a bus. Expect slightly colder evenings in Lisbon when traveling from Sagres in August, with lows around 20°C. On the 9th (Fri), wrap the sightseeing up by early afternoon so you can travel back home.